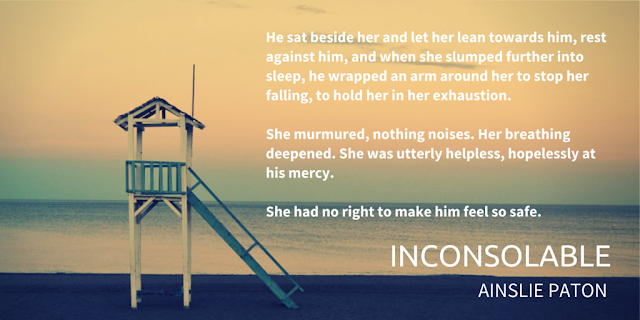 Today is the release day of Inconsolable by Ainslie Paton and we have an excerpt to share! Foley has a new boss she doesn’t like, a flatmate who’s been known to wear odd shoes, and a car that’s ready to pack it in. She hasn’t met a guy worth lipstick in forever and she planned on living a life less ordinary, but the only thing unique about her is a badly thought through tattoo. Until Drum. Drum was a different man before he made a home for himself in a cave tucked in a cliff face. He wanted to get as far away from the destruction he’d caused as possible. Now he wakes with the sun and runs on the beach, does odd jobs for cash to buy food and is at peace. Until Foley. It’s Foley’s job to find Drum a new place to live. But homeless people have rights too, and the only home Drum wants and knows he can’t have is in Foley’s heart. Foley wore office clothes, a dress, shoes that had no business being on a rock face. He’d never seen her dressed like this, the flipside of her lovely casualness last night. She’d gotten too comfortable coming here and that was his fault. He should never have let her stay for the sunrise. Never have gotten in her dinky little car. Never have agreed to go with her to Fat Barney’s. He should never have touched her. It was bad enough he could no longer stop himself looking at her. He looked at her now with her shiny hair and her sunglasses, with her bribery in hand. He could smell Chinese food and his traitor gut rumbled. She stepped down onto the lower ledge as if this was a shopping centre or a movie theatre and she was here for the entertainment value. He should go out the back way and be damned, she couldn’t follow him in those shoes, she couldn’t make the jump in a dress that was slicked to her hips and thighs. He stood up to go and she said his name and smiled as if there was a reason he might like his name on her lips, those lips curved to smile, that he might like her. That did it. She couldn’t stand here and smile at him like that, because he did like it. She thought he didn’t recognise her. But he knew who she was. She was bright and fresh, light and hope, and all the entrancing things he’d given up and no longer deserved. He roared at her. Incoherent sounds of noise and hate and fear. She had to get away from him, before he infected her, made her dirty. He had to make her understand that. She dropped the food, her bag, and she put her hands up, but he kept on, voice raised, swearing at her. He had no way of knowing how long he raged, how little sense he made, but after a time there was nothing left of her but a huddle of knees and red and black fabric, jammed against the rock. He stopped, hands to his head, tongue so unstuck he could rip it out, towering over her as she hid from his verbal assault. He left her there. He was a monster. She’d see that now. He went to the edge and curled his toes over. The sea was churned up, cut, choppy from the wind and rain. He needed this. He listened for her, ached to hear her scrambling away. He closed his eyes and softened his knees. He’d hurt her when he’d been trying not to. Why did she keep coming to him? Why did she make it so hard? The wind scoured his skin, but didn’t rub the filth of him away. Her voice wrapped around him and held him steady. She should be gone. He should be alone. She was frightened. And so was he, frightened of what she made him feel, of how much he wanted to hear her voice, see her smile, touch her skin and have the life of her close to him. He took a step back from the edge. Her breathing was all broken up, choppy like the sea. He took another step back and another and another, then turned to face her. Her shoes were off, her sunglasses, her hand was over her mouth and she shook like the wind was inside her. What could he say? What would she understand? He took a step towards her and she nodded, turned to pick up her shoes. “Stop.” He put his hand out. He no longer wanted her to go. He needed to explain. She straightened up but kept her eyes down. She was ready to run, her shoes in her hand. His reality was bad enough; he couldn’t send her off with nightmares. She sobbed aloud, then clamped a hand over her mouth. Her eyes were shocked into hard marbles, glistening wet and fixed on him. He took another step away from the edge, closer to her. He could smell sweet white flowers; her perfume. He lifted his hand to her, wanting to take the fear away, not knowing how, but she reached her hand out too and their fingers brushed, then her hand was in his, like that one time before but different too, because this time she truly knew to fear him and still she touched him. And he couldn’t take it. It mattered that he’d scared her. It mattered that she was here. He closed his hand around hers and stepped closer. She dropped her shoes. He watched as her breath settled as she blinked slow, squeezed her eyes to stop them tearing up. 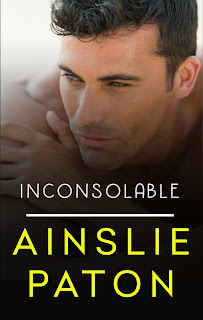 Inconsolable by Ainslie Paton is a contemporary romance, released by Escape on August 22, 2015. She’s written about everything from the African refugee crisis and Toxic Shock Syndrome, to high-speed data networks and hamburgers. As Ainslie and as AA Paton, she writes cracking, hyper-real contemporary romances.